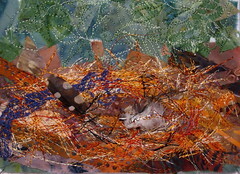 I was thinking originally about eggs for easter, but I got so captivated making the nest i stopped at the end. It is too cold still for eggs anyhow. Well, actually, for the last couple days it has felt like summer; warm and smooth and sunny and blue skied. I'm taking the girls to DC tomorrow, we'll be there two nights, three if a room opens up in the hotel while we are there. We're going to the Air and Space Museum, and back to the Air and Space Museum (again) and maybe to the new Native American Museum and maybe the Natural History Museum (we are science geeks, after all). Maybe the zoo to say hi to the Pandas too.